Today's "gravy" recipe is not exactly gravy, at least not in the traditional sense. But it is a "sauce" - and sauces are synonymous with "gravy" in some other languages, right? 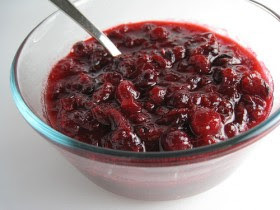 Cranberry Sauce seems to be a standard item at most Thanksgiving tables, but this takes plain old jelly-in-a-can cranberries up SEVERAL notches. It's super easy to throw together at the last minute; looks, smells and tastes impressive and will win you raves reviews from everyone, I promise! Again, the alcohol cooks out, though I did use a grape juice/pomegranate juice blend instead once and it was also very good. This recipe is graciously shared by one of my favorite local cooks, Julie Hasson. She's the author of 5 cookbooks, does the awesome vegan online cooking show "Everyday Dish" (which you should watch every episode of over Thanksgiving break, if you haven't already - go, do it now!). She and her hubby own the completely delicious food cart "Native Bowl" in Portland. And best of all, she's also a great resource; graciously (and patiently) answering every question I tend to e-mail her about what to do and where to eat vegan when I'm IN Portland!! Not only are cranberries delicious, but they’re also a great source of antioxidants. Although you may be tempted to cut down on the sugar in this recipe, it’s a pretty tart sauce. In a medium saucepan combine all of the ingredients and bring to a simmer over medium high heat. Reduce heat slightly and simmer 10 minutes stirring occasionally. Cool and serve. Seriously, that's all there is to it! Easier than gravy even! Try it, it'll make a great addition to your table on Thursday! I'm anxiously awaiting Hasson's Vegan Diner, out next year. Should be some good comfort food type things in there! i LOVE this sauce!! saw it and got the ingredients for thanksgiving. we were out of orange juice so i used fresh lime juice and it was wonderful!! ate it with field roast's hazelnut cranberry roast and again with seitan the next day. so delicious, i will be making this again! !